Pablo is a specialised physiotherapist in sports injuries and musculoskeletal pain conditions who brings a friendly and holistic approach to his work. 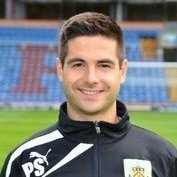 Pablo was at Premier League club Burnley Football Club for over seven years with almost five years as first team physiotherapist, so he has extensive experience working with sports injuries in elite athletes and sportsmen and women. Pablo is registered with the Health and Care Professions Council (HCPC) and is a member of the Chartered Society of Physiotherapy (MCSP).